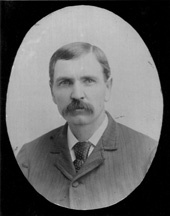 GRONNA, Asle Jorgenson, a Representative and a Senator from North Dakota; born in Elkader, Clayton County, Iowa, December 10, 1858; moved with his parents to Houston County, Minn.; attended the public schools and the Caledonia Academy; taught school in Wilmington, Minn.; moved to Dakota Territory in 1879 and engaged in farming, teaching, and business; member, Territorial house of representatives 1889; president of the village board of trustees of Lakota and president of the board of education several terms; member, board of regents of the University of North Dakota 1902; elected as a Republican to the Fifty-ninth, Sixtieth, and Sixty-first Congresses and served from March 4, 1905, until February 2, 1911, when he resigned, having been elected Senator; elected as a Republican in 1911 to the United States Senate to fill the vacancy caused by the death of Martin N. Johnson; reelected in 1914 and served from February 2, 1911, to March 3, 1921; unsuccessful candidate for renomination in 1920; chairman, Committee on Expenditures in the Department of the Navy (Sixty-second and Sixty-fifth Congresses), Committee on Agriculture and Forestry (Sixty-sixth Congress); resumed agricultural pursuits; died in Lakota, N.Dak., May 4, 1922; interment in Lakota Cemetery. Phillips, William W. The Life of Asle J. Gronna. Ph.D. dissertation, University of Missouri, 1958; Schlup, Leonard. North Dakota Senator Asle J. Gronna and the Isolationists, 1915-1920." North Dakota History 60 (Fall 1993): 13-21.